"Wake up! I want down again"
Indoor dog ramps allow small or toy dog breeds access to taller surfaces without causing stress on small joints. 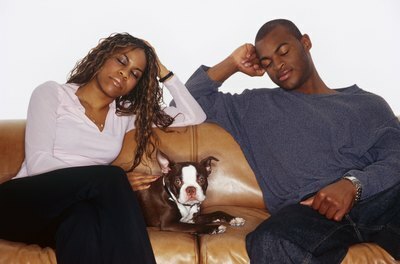 Older pets with sore joints or arthritis may need assistance reaching your bed or couch in order to snuggle with you. The correct ramp for your pet allows him more freedom. Step on a bathroom scale and weigh yourself. Hold your dog and reweigh yourself. Subtract your weight from the combined weight of you and your pet to get his weight alone. Multiply the amount of your pet’s weight times two to choose an indoor dog ramp that supports twice his weight. This rule of thumb is important especially if your pet is rambunctious. The idea of the ramp is to help him access areas and avoid injuries, not to jump on it full force and break the ramp. Secure a ramp that is 12 inches wide for toy to medium dogs without balance problems. Choose a wider ramp that is 16 inches for larger dogs or a dog with balance problems. No matter the width you choose, it is important that your dog ramp include side rails to keep your four-legged friend from sliding off either side of the ramp. Choose the correct slope for your dog's ramp based on the reason for him needing a ramp. A steep slope of 26 degrees works well for young, small and medium breeds with lots of energy to scamper up a ramp with. A 22-degree slope is normal with a more moderate incline for dogs with some muscle impairment and an 18-degree slope works well for older dogs with limb weakness. Visualize the slope and length of a pet ramp to make certain that it fits in the area where you will place it. Place the tip of a measuring tape on the floor at the base of the item where your pooch requires a ramp. Stretch the measuring tape straight upward to 24 inches. Mark the area with a piece of masking tape. Stretch the tape measure out to 74 inches and lock it in place. Hold the tip of the tape measure on the masking tape and lay the other end on the floor. This is for an easy 18-degree slope. Reduce the length of the measuring tape to 64 inches for a normal slope or 55 inches for a climbing slope. You may have to choose a different end of the couch or bed to place your pet ramp depending on the slope and length your dog needs. He won’t mind if you rearrange furniture for his benefit. Dog ramps with a flat platform at the top help older dogs or debilitated pets gain balance before they step onto a bed or couch. Some ramps have removable covers to launder when they get muddy paw prints on them. Keep your dog’s nails trimmed when he uses ramps to prevent claws from catching on carpeting or the covering.